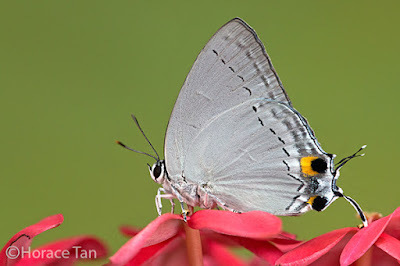 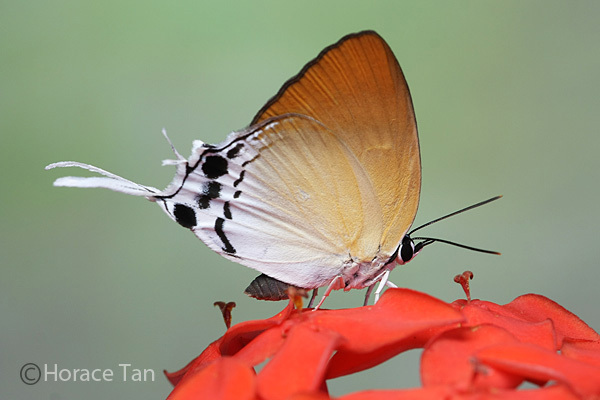 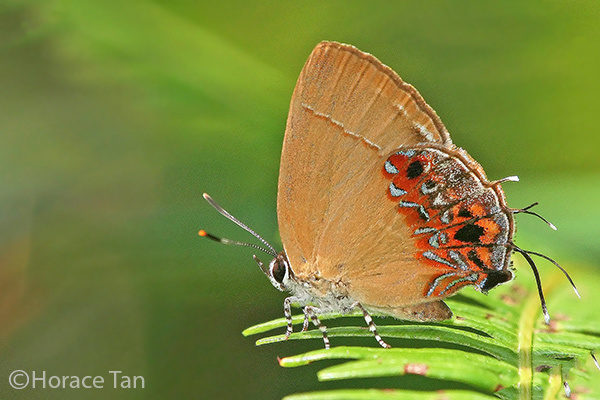 This 12th instalment of our Butterflies' Larval Host Plants series features Macrosolen cochinchinensis (Common Chinese Mistletoe), a member of Loranthaceae which is a family of flowering plants containing 75 genera and about 1,000 species, many of which are hemiparasites (parasitic plants which derive water/nutrients from the hosts and are photosynthetic themselves). As is the case of the Malayan Mistletoe, the Common Chinese Mistletoe is a stem hemiparasite, attaching itself to the stem/branch of their hosts. 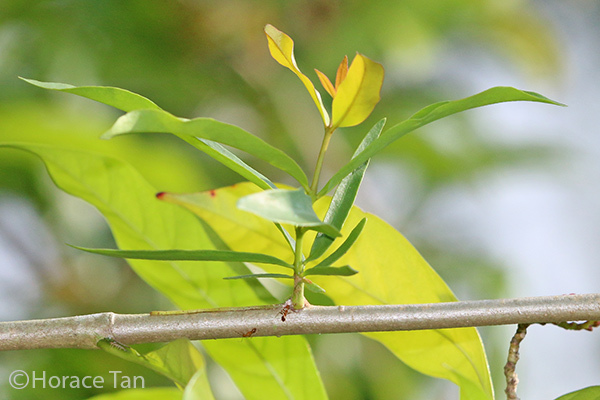 Common Chinese Mistletoe residing on a Lagerstroemia turbinata (Malayan Crape Myrtle) plant in the Japanese Garden. In terms of commonness among the 10 extant parasitic plant species in Singapore, the Common Chinese Mistletoe is only second to the Malayan Mistletoe. Trees and shrubs (of many species across multiple families) growing in urban areas, residential estates, parks and gardens, wastelands, wetland and nature reserves have been observed to carry it, sometimes appearing together with the Malayan Mistletoe on the same hosts. Left: The Common Chinese Mistletoe on a Ficus plant along the Jurong Park Connector. Right: A closer view. 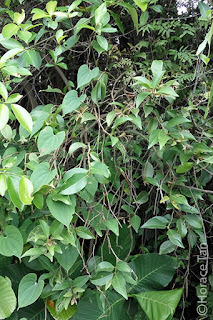 Synonyms: M. fordii, Loranthus cochinchinensis, L. ampullaceus, L. fordii, Elytranthe ampullacea, E. cochinchinensis, E. fordii. Country/Region of Origin : Southern China, Nepal, India and South East Asia. 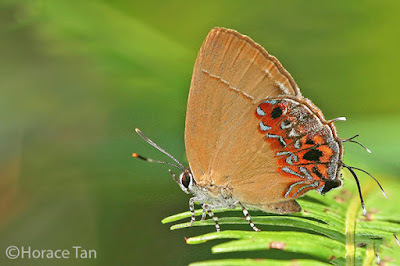 Larval Host for Butterfly Species: Arhopala centaurus nakula (Centaur Oakblue), Tajuria cippus maxentius (Peacock Royal), Tajuria mantra mantra (Felder's Royal), Euthalia adonia pinwilli (Green Baron), Jacoona anasuja anasuja (Great Imperial), Manto hypoleuca terana (Green Imperial), Semanga superba deliciosa. 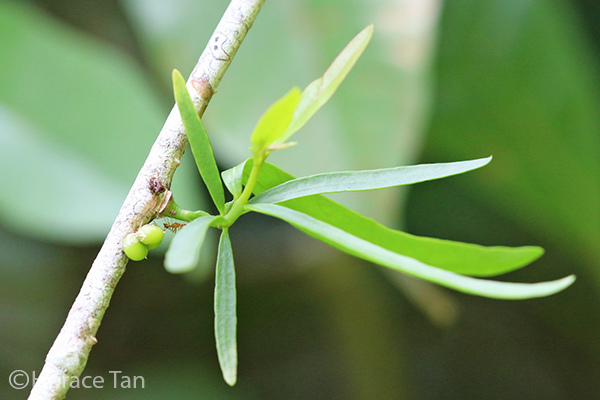 Common Chinese Mistletoe found on a Polyathia longifolia (False Ashoka) plant in the Chinese Garden. 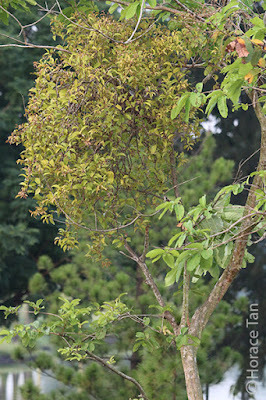 The Common Chinese Mistletoe is an epiphytic shrub between 0.5m to 1.3m in height. 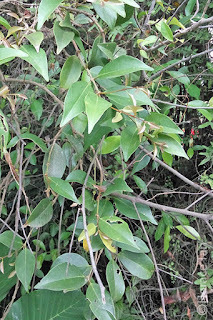 Branches/stems are greyish, usually with lenticels scattered on the surface. The leathery leaves are broadly elliptic or ovate to lanceolate, and sizes (5-10cm in length, 2.5-6cm in width). Leaves are initially pale reddish brown, but turning yellowish green and finally dark green when fully mature. 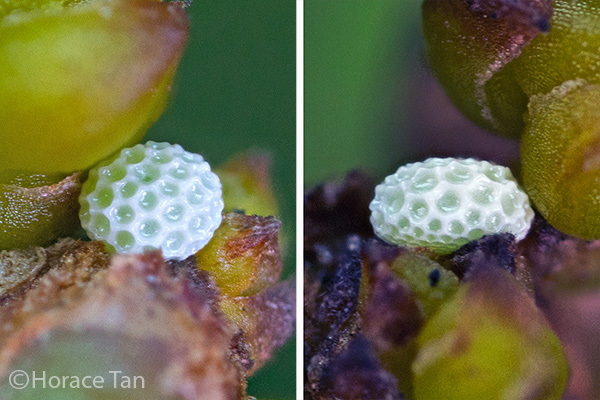 Tiny young shoots of the Common Chinese Mistletoe with a young caterpillar of the Green Imperial well concealed among the leaves. 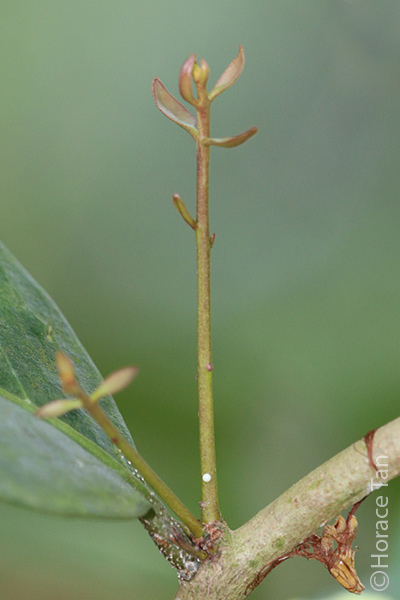 Another young shoot, with longer stem, bearing an egg of the Peacock Royal. 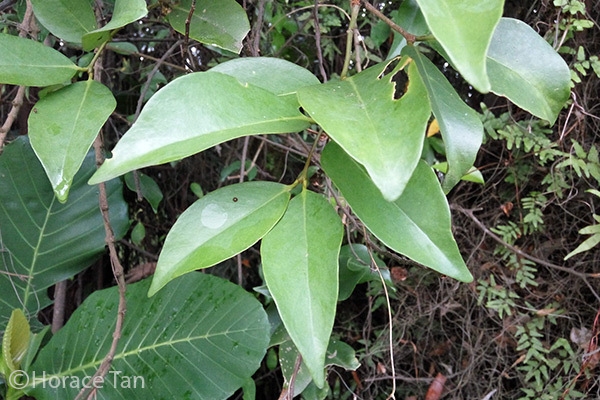 Maturing leaves of the Common Chinese Mistletoe, yet to lose their pale brown coloration. A branch showing mature and maturing leaves. 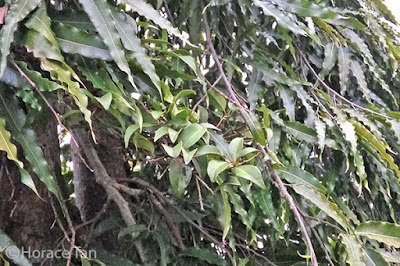 Note the leaf arrangement. 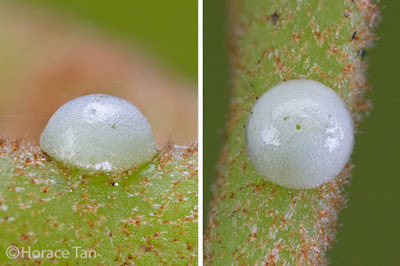 A branch of the Common Chinese Mistletoe bearing mature leaves, one of which is adorned with an egg of the Green Baron. 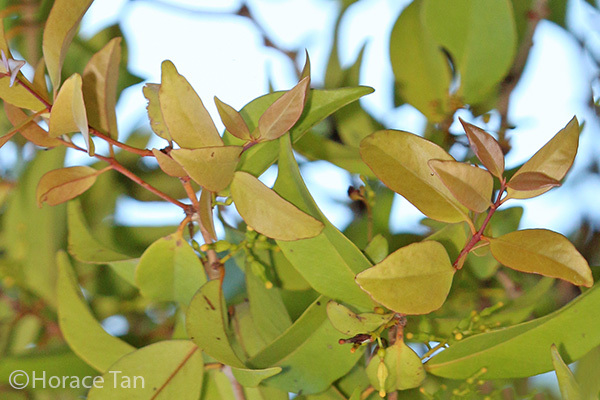 Similar to the Malayan Mistletoe, fruits of the Common Chinese Mistletoe are typically dispersed by birds. The sticky coat of the seed allows it to easily adhere to the stem/branch surface of the host plant it lands on (after being carried there by birds or another forces of nature). The germinating seed will grow a green bending stalk with a disc-like tip, which eventually makes contact with the host's surface and develop into the first haustorium. The haustorium is a specialized root which penetrate into the host's tissues and connect to the xylem/phloem of the host, allowing it to draw water and non-organic nutrients from the host. The first leaves of the young plant come in an elongated form, in contrast to the more ovate form in grown plants. 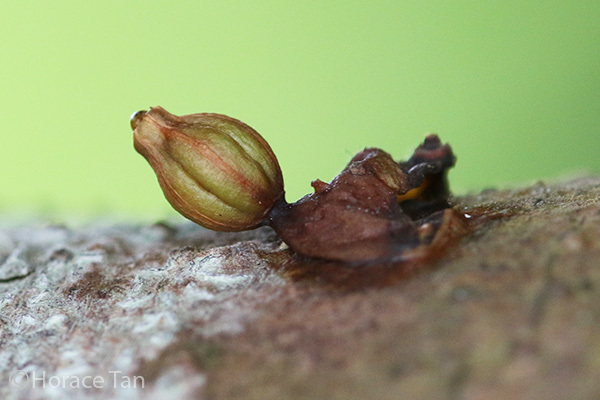 The exposed seed of the Common Chinese Mistletoe sticking to the surface of a host's branch. A young seedling of the Common Chinese Mistletoe on a branch of a Kopsia fruticosa, note the elongated leaves. 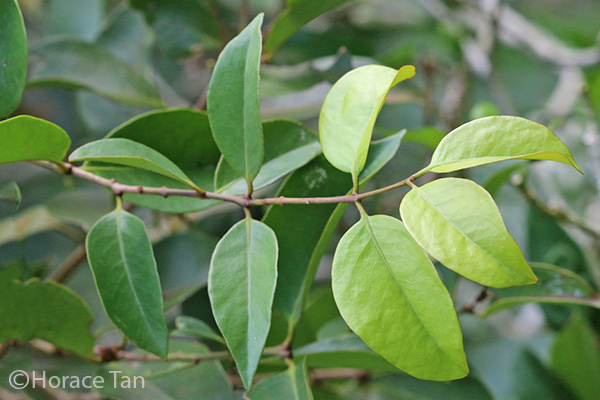 A young seedling of the Common Chinese Mistletoe with both elongated and lanceolate leaves. 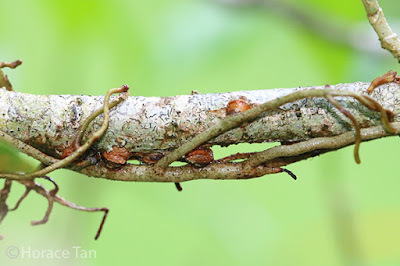 As it grows, the Common Chinese Mistletoe develops side roots running alongside the branch of the host, with haustoria occur at intervals to penetrate into the host plant for more anchorage and nutrient-intake points. Side roots and secondary hautoria of a Common Chinese Mistletoe. 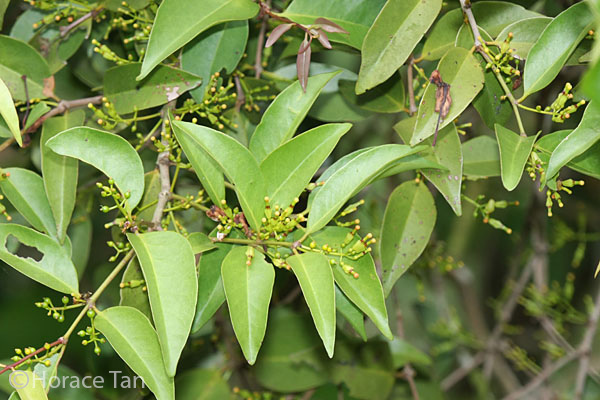 Flowers of the Common Chinese Mistletoe are bisexual and occur in racemes, each of which bearing 4 to 8 flowers. 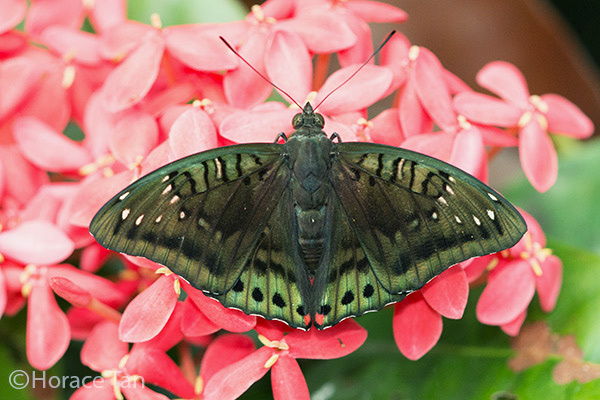 Each flower is green with yellow-tipped petals. 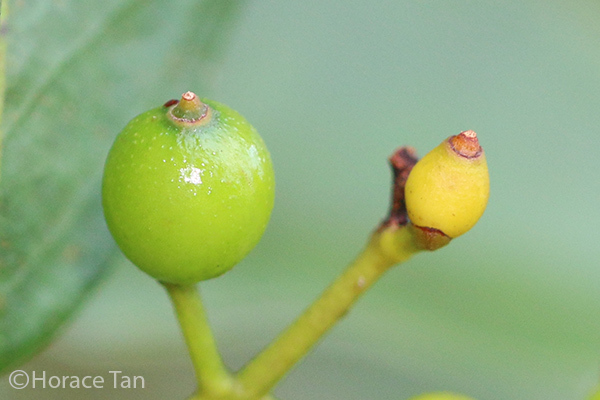 The basal part of the corolla is slightly inflated. 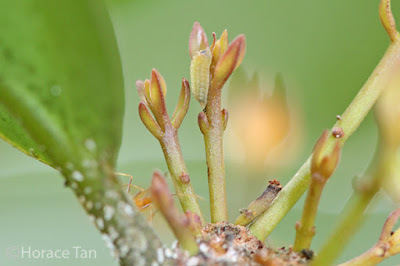 Young flower buds of the Common Chinese Mistletoe. 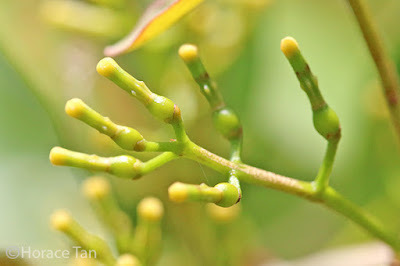 A closer view of flowers of the Common Chinese Mistletoe. Fruits are small and sub-globose, about 5mm in diameter, initially orange, turning green as it develops, and finally dark reddish brown when fully ripened. A branch of the Common Chinese Mistletoe bearing developing fruits. Close-up view of two fruits of the Common Chinese Mistletoe. 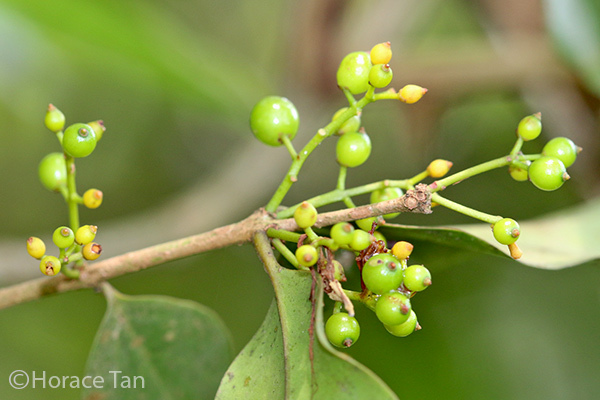 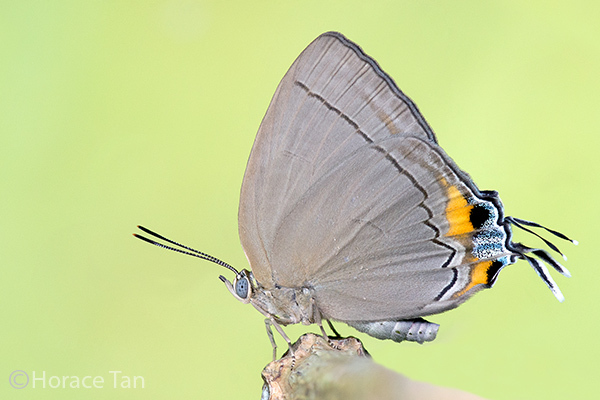 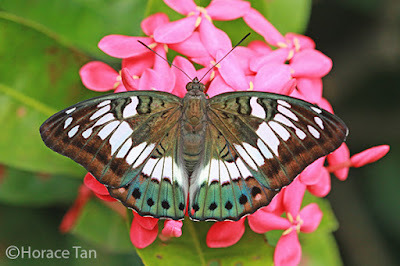 In Singapore, the Common Chinese Mistletoe serves as the larval host plant for seven butterfly species in two families: Centaur Oakblue, Peacock Royal, Felder's Royal, Great Imperial, Green Imperial, Semanga superba deliciosa and Green Baron. The first six are lycaenid and the last is a limenitid. 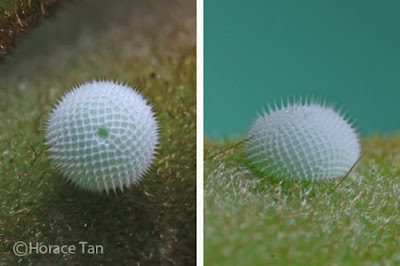 Eggs of the six lycaenid species are typically laid singly on young shoots or underside of young leaves. 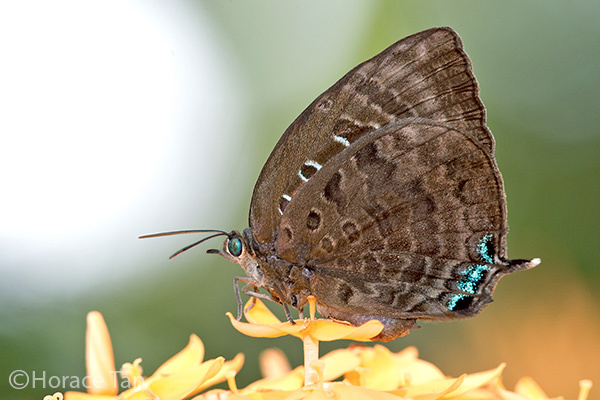 One exception is Semanga superba deliciosa which have been observed to lay eggs in small clusters of 2-3. 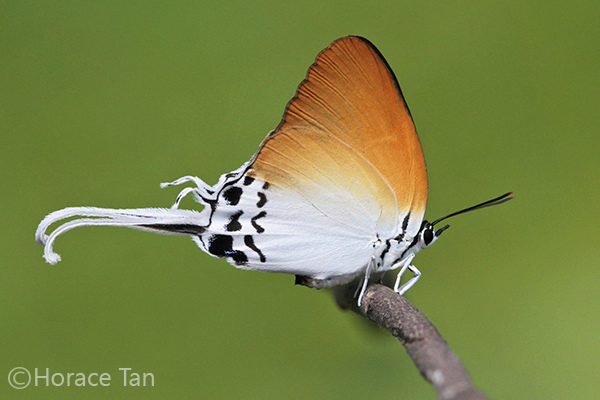 In contrast, the eggs of the Green Baron are laid singly on the upperside of a mature leaf. Two views of an egg of the Centaur Oakblue. Two views of an egg of the Peacock Royal. 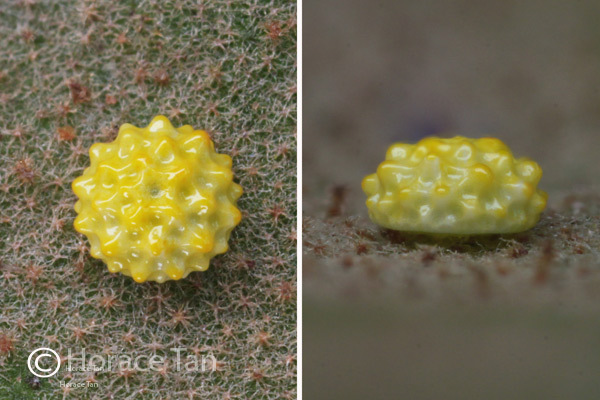 Two views of an egg of the Felder's Royal. 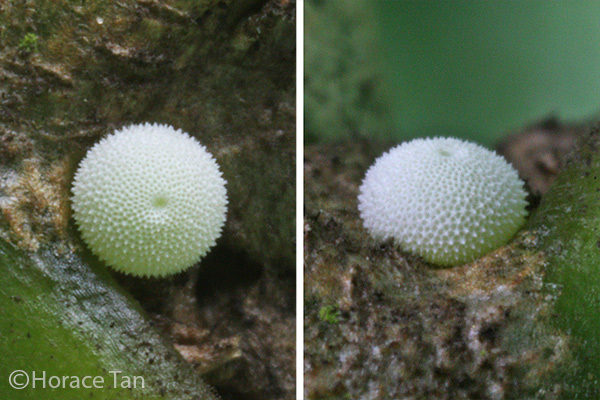 Two views of an egg of the Green Imperial. 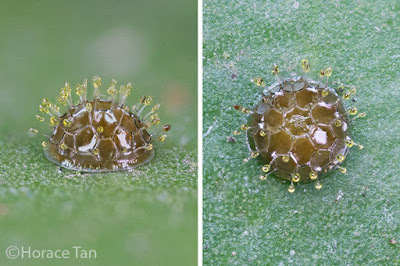 Two views of an egg of the Great Imperial. 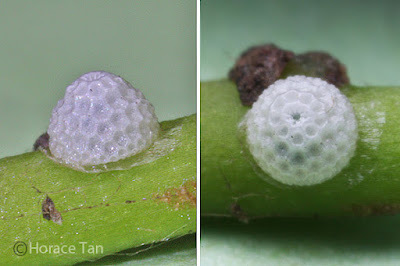 Two views of an egg of the Semanga superba deliciosa. Two views of an egg of the Green Baron. Caterpillars of all six lycaenid species feed on young leaves and young shoots of the Common Chinese Mistletoe, with those of the Semanga superba deliciosa have the added habit of feeding on flowers and flower buds. 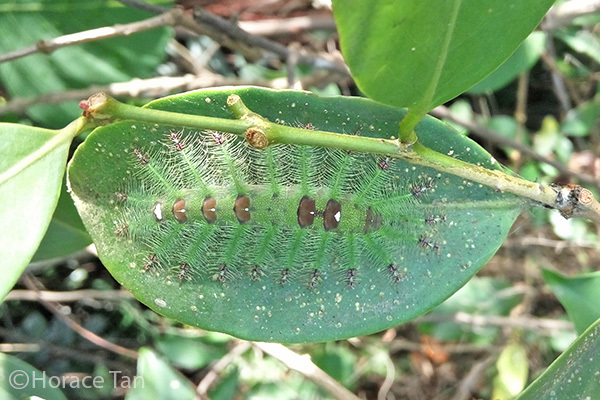 These lycaenid caterpillars are usually sighted with ants in attendance. 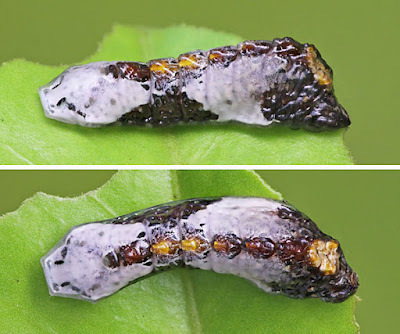 Caterpillars of the Green Baron, in contrast, feed on mature leaves of the Common Chinese Mistletoe and have the habit of resting on the upperside of a leaf. 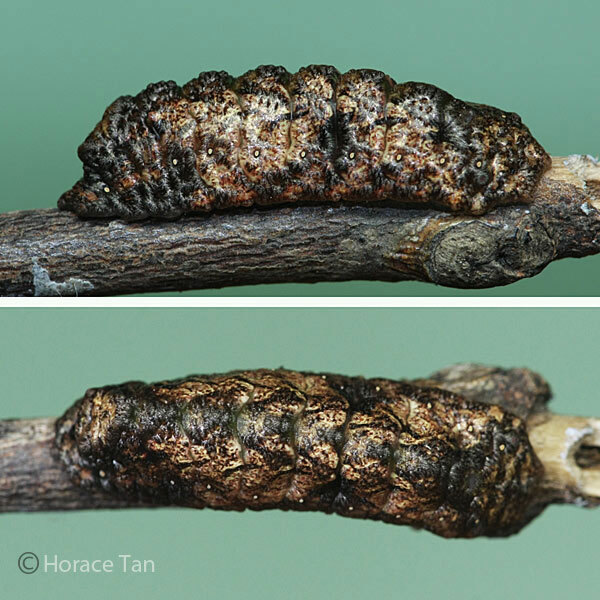 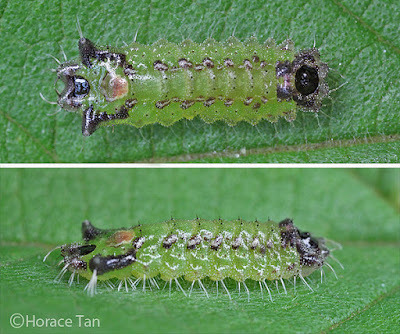 Two views of a 5th instar caterpillar of the Centaur Oakblue. 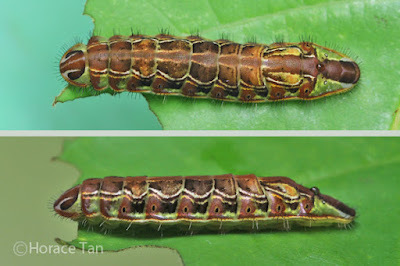 Two views of a 4th instar caterpillar of the Peacock Royal. Two views of a 4th instar caterpillar of the Felder's Royal. Two views of a 4th instar caterpillar of the Green Imperial. Two views of a 4th instar caterpillar of the Great Imperial. 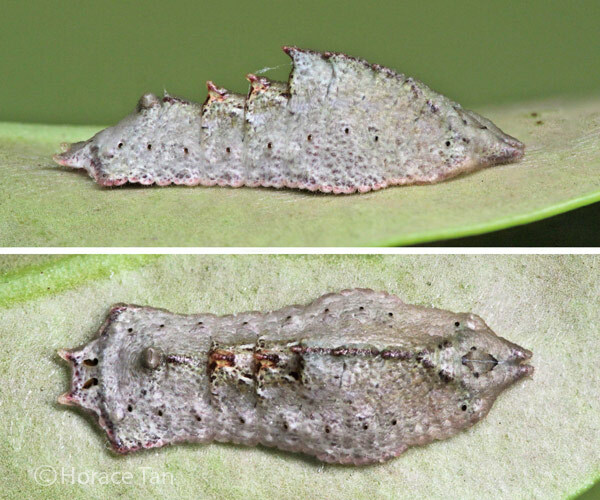 Two views of a 5th instar caterpillar of the Semanga superba deliciosa. 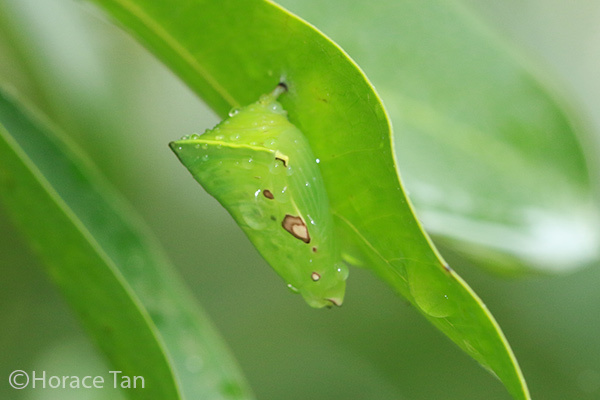 A final instar caterpillar of the Green Baron resting on a leaf of the Common Chinese Mistletoe. 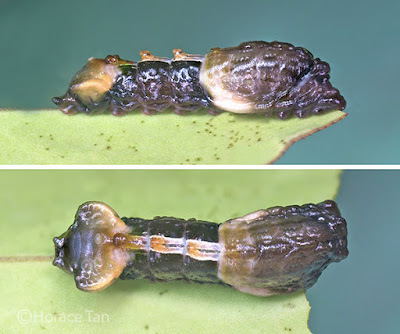 A pupa of the Green Baron found on the underside of a Ficus leaf in the vicinity of its mistletoe host. The Concise Flora of Singapore : Hsuan Keng Singapore University Press, 1990.
tHE tiDE cHAsER - Mistletoes of Singapore. Flora of China - Macrosolen cochinchinensis. NPark's Flora Fauna Web - Macrosolen cochinchinensis. Nature Loves You - Macrosolen cochinchinensis. 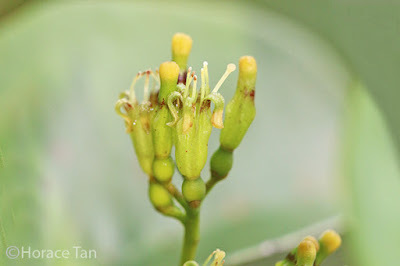 Bird Ecology Study Group - Mistletoes 5: Germination of Macrosolen cochinchinensis. Text and Photos by Horace Tan.